This article gives the information of PCI. PCI or peripheral component interconnect standard specifies a computer bus for attaching device to a computer motherboard. 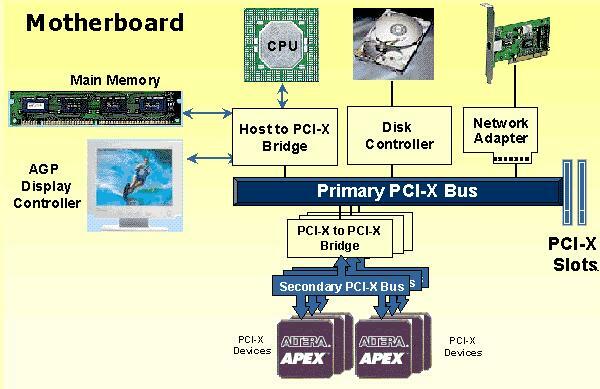 The PCI bus is a high speed bus that connects high performance peripherals like video adapter, disk adapter, and network adapter to the chipset, processor and memory. Unlike previous buses that linked tightly the processor to the expansion slots, the PCI bus electronically isolates the processor from the PCI expansion slots. This allows more PCI slots to be supported and removes performances constraint on the use of those slots. The most recent motherboard usually provides four or five PCI slots. The chipset provides bridging function between this IO buses and between IO buses and other system buses, including the memory bus. Any system or motherboard today should provide PCI expansion slots in adequate number for system needs. PCI is an evolving standard. Recent models used PCI 2.1 allowing upgradeability. Today’s motherboard use PCI 2.2 is already defined and implementations are on their way. PCI expansion buses differ in two respects that determine their performance: PCI bus width and bus speed. PCI with 32 bits width at 33.33 MHz generating 133.33Mbytes is found in desktop ad entry level service. PCI with 64 bits width at 66.66 MHz generating 133.33 Mbytes is more commonly found in mid range to high servers. Specifications listed below represents the common version of PCI used in normal PCs. 33.33 MHz clock with synchronous transfer. 32 bit address space (4 gigabytes). Extremely high speed data transfer: 32 bit wide data transfer @ 33 MHz gives a maximum throughput of 132 Mega bytes per second. Data transfer @ 66 MHz with 64 bit wide data is now being offered. Processor independence: The PCI local bus fulfills the need for local bus standard that is not directly dependent on speed and structure of the processor. Full multi master capability: This allows any PCI master to communicate directly with other PCI master or slave. 5. Parity on both data and address lines: This allows implementation of robust system. Support for both 5V and 3.3V operated logic. 6. Forward and backward compatibility between 66 MHz and 33 MHz PCI.